Figure 1. Deconvolving nearly isobaric peaks. These data represent spectra consistent with those obtained from a Waters Q-TOF Premier with a resolution of 7227 at 273 Da. Table 1: Comparison of rank positions attained by correct (known) IDs within composition search candidates listings produced from peak lists generated in a comparison of three software packages. Figure 2: Limiting Deconvolution Resolution benchmarked as a function of dynamic range in peak height ratio of peaks deconvolved. Error bars denote the range between successful (filled circle) and unsuccessful (open circle) deconvolutions of peak pairs at different spacings for each package tested. All comparisons were conducted against the same continuous raw spectra. In raw mass analyzer data, what appears to be a single peak is often two or more overlapped (nearly isobaric) peaks that are unresolved by the mass analyzer. Current software offerings provide centroid results for peaks that are sufficiently resolved in the raw spectra (observable inflection points) to be detectable by the software. When addressing this challenge it is helpful to first understand the problem in terms of Deconvolution Resolution. PeakInvestigator™ software detects and separates overlapping peaks that other leading centroiding software simply cannot detect. This ability to precisely deconvolve previously hidden overlapped peaks equates to a 3-4x increase in the effective resolution of your mass analyzer. < 21 mDa, that are unresolved at this analyzer resolution of just over 7,000. The two known components forming the raw spectrum are: C10H14N2O2Br1 (250 counts) and C8H17O6S2 (250 counts). With no recognizable inflection point in the raw data between the two components, conventional centroiding solutions (e.g., Cerno's MassWorks™ 3.0 or Exact Mass in MZmine 2.10 software) failed to detect or deconvolve such closely overlapped peaks. They found only a single peak, with poor mass and abundance precision versus the two components known to be present. PeakInvestigator software uses advanced signal processing algorithms that thoroughly analyze the mass spectrum to correctly detect and deconvolve the hidden peaks, providing 10-fold improvements in mass and abundance precision in this example. When a single centroid is produced from multiple overlapped peaks, mass and abundance precision is lost in the resulting peak list. These precision challenges add to the underlying mass calibration and accuracy problem, making it difficult to determine the charge state and which isotopic peaks belong together. These issues combine to expand the number of compositional candidates that must be considered and eliminated in downstream identification efforts. Having more candidates means more samples and more time spent investigating and validating leads. Continuing with the example from Figure 1, the impact of mass and abundance precision upon correct ID is evident in Table 1. 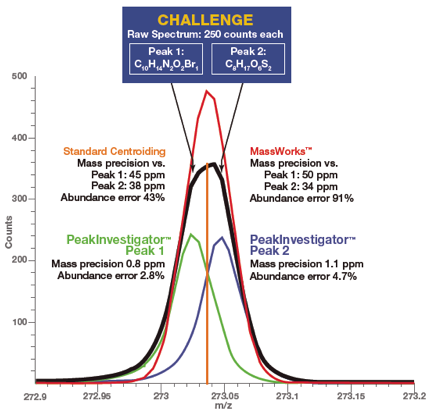 Peak detection failures and imprecision in the MassWorks and Standard Centroiding mass and abundance calls pushed the correct compositional IDs down from the top of the candidates list. When deconvolving peaks other software fails to separate, PeakInvestigator software’s improved mass and abundance precision produces better compositional ID search results. This translates into less time, resources and fewer samples consumed in your biomarker identification and validation work. More importantly, abundance errors contribute to the risk of validating incorrect biomarkers in your data, with even more serious consequences for misdirected and ineffective R&D. PeakInvestigator software outperforms other peak detection and deconvolution methods, maintaining 3-4x improved effective resolution across a wide dynamic range. Deconvolution of overlapping peaks becomes more challenging as the ratio of the underlying peak heights changes. Here we use Limiting Deconvolution Resolution to compare the performance of the three software platforms across a dynamic range of peak height ratios, from 1:1 on the right side to about 7:1 on the left side (Figure 2).